Noah Hicks runs a makeshift bike-repair school out of a shed in an open lot. About 15 years ago, a wide-eyed entrepreneur opened a premium ice cream shop on Bowdoin Street in Dorchester, a neighborhood known more at the time for gangs than gourmands. The store didn’t last long. Now comes a push by local residents and a business revitalization group for a bicycle shop on Bowdoin Street, an area that serves as a bellwether of change in Boston’s low-income neighborhoods. A bike shop would be a better fit on Bowdoin Street than fancy frozen treats. But it will be an uphill fight. The hipsters, activists, and downtown business commuters behind the surge in cycling don’t live, for the most part, in the 68-block Bowdoin-Geneva neighborhood. And the neighborhood’s residents aren’t rolling in money. City Hall looks serious about expanding ridership in low-income areas. Its “Roll it Forward” program collects and repairs used and abandoned bikes for distribution to people who otherwise couldn’t afford them. Yet there are no bike lanes along Bowdoin Street, Geneva Avenue, and other key thoroughfares. City officials proudly offer subsidized memberships to Boston’s bike-share program. Yet there are no bike-share docking stations in Bowdoin-Geneva or other neighborhoods where many people of modest means would qualify for reduced user fees. One reason might be that official counts of riders used to determine interest in biking generally take place along the city’s major commuter routes during peak business hours. Many neighborhoods operate on a different schedule. So how great is the demand for bicycles in Bowdoin-Geneva? 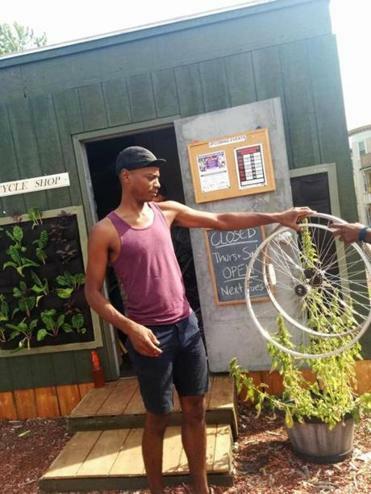 On Tuesday, Noah Hicks, bike mechanic and local resident, held court at his makeshift Bowdoin Bike School in an 8-feet-by-10-feet shed on an open lot at the corner of Bowdoin and Topliff streets. About 15 bikes — in various states of disrepair — filled much of the shed, including English and Dutch models. Boxes of grips, shifters, stems, and brake pads lined the shelves. Neighborhood kids, mostly in their early teens, descended on the space as Hicks pulled the donated and abandoned bikes from the pile and set them up on repair stands. Hicks said that much of the cycling interest in the neighborhood falls into the category of “subsistence biking.” It’s common, he said, to see older residents balancing groceries on their bikes. Biking in Bowdoin-Geneva is not so much a lifestyle choice as an essential form of transportation. Not a dime changed hands during several hours of bike repairs. Hicks manages to keep the bike clinic rolling with a combination of donations and crowd funding via the Internet. It’s not, however, an entirely selfless venture. Eight years ago, Hicks was broke and addicted to alcohol. Repairing and riding bikes, he said, put him on the path to recovery. “This is my definition of mindfulness,” said Hicks as he surveyed the swirl of people and bike parts. Gene Gorman, the director of the Bowdoin-Geneva Main Streets revitalization group, believes that the neighborhood is ready for a bike shop and that Hicks has “demonstrated to investors that this can work.” Hicks certainly has exposed the need. But it’s not clear that residents in the neighborhood can afford to support a commercial bike shop. One possible solution might be for Hicks to join forces with neighborhood leaders who are trying to create a member-owned food co-op on Bowdoin Street. They are out to prove that fresh food doesn’t need to be the exclusive domain of the well-to-do. Much depends on loans, grants, and the sale of equity shares. But the prospect of a bike shop attached to a food co-op could only attract more customers and greater interest from foundations and philanthropists. Hicks is a natural teacher. He could use those skills to raise funds by expanding a pilot program in the Boston schools that provides students with an opportunity to build and customize their own bikes. The opening of a bricks-and-mortar bike shop in Bowdoin-Geneva may be a longshot. But access to bikes and bike repair is a key part of moving this neighborhood forward. And Hicks can’t make this journey alone.